Oh my, there is so much music out there where do you start? How much of the music kids hear now-a-days can they actually learn from? It can be very overwhelming when you look. and well lets face it... super annoying, drive you batty music. Don't get me wrong, everyone wants there kiddo to jam out and have fun. At what cost? Well not my sanity. I was actually quite surprised. The music took me back! Groove Kid Nation continues its award-winning music education series with a third release Rhythm Bears. Producer Rodney Lee once again recruits top L.A. musicians and heads deep into the woods to create a soulful folk hoedown. As the title suggests, Rhythm Bears is all about drawing kids into the music with rhythmic call and response games that will have them clapping, stomping, playing percussion, and vocalizing to the beat. In addition, a band of groovy bears open childrens’ ears to a whole new set of musical instruments including harmonica, fiddle, acoustic guitar, acoustic bass, clarinet, kalimba, ukulele, and even didgeridoo. 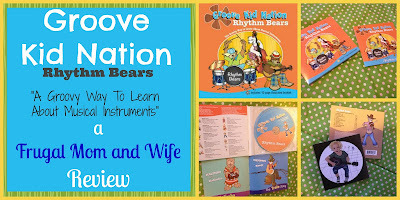 Each song features a new instrument, and the enclosed 10-page booklet features colorful illustrations of each Rhythm Bear. Groove Kid Nation is helping pave the way. You can get Groove Kid Nation "Rhythm Bears" for Only $10.99 HERE.